Martial arts were introduced into the norther provinces during the fourth century. At first practiced on temple grounds. Its practice soon spread to include self protection because these were violent and uncertain times marked by intense quarreling and fighting amoung the three kingdoms of Korea. After a long struggle Silla emerged victorious and in 668 AD all three kingdoms were united. In Silla a group known as the Hwa Rang developed. They were a select band of young members of nobility organized by King Chinhung. They received instruction in religion, dance, literature, arts, and sciences and they were also taught the arts of warfare. Trust in brotherhood among friends. Courage never to retreat in the face of the enemy. Justice to never take a life without cause. In 935 AD Silla was overthrown by the warlord Kyong-Hum who founded the kingdom of Koryo from which the western name for Korea is derived. During this period Koryo remained strong in martial spirit and produced the finest solders in Korea History. After 500 years of rule (935-1392) the Koryo Dynasty declined and was replaced by the Yi Dynasty (1392-1910) which held learning and scholarship in high esteem than martial arts. During this time all arms privately owned were collected and recast to agricultural tools. During the Fifteenth century the Korean alphabet (hangul) was developed, although Chinese continued to be the official language as was Latin in Europe. The compilation of Tonggu Tonggam a history of Korea began in 1458. A book titled Muye DoBo Tongji documenting martial arts techniques was written. This is the only written historical record of ancient martial arts practiced in ancient Korea. In 1874 the United States Navy invaded Korea to open Korea to United States trade. Unfortunately the navy failed to communicate with any of the Korean Military. The resistance would never show themselves. The United States had already forced Japan to sign trade agreements with the west a few years earlier. In 1876 Japan invaded Korea for the same reason, the result was a trade agreement with the west and the United States government allowed Japan to annex Korea. In 1876 Japan removed the ruling members of the Yi Dynasty and replaced it with a Japanese colonial Government. In 1895 Japan formally annexed Korea, and renamed her Chosan, Everything that was Korea was ordered to be changed, language, religion, customs, games, sports, and all forms of entertainment. Koreans were ordered to stop martial arts training. In 1910 the Japanese colonial rulers burned over 300,000 Korean books after it announced to the world the Korean Peninsula was part of Japan. Japan had done exactly the same thing to the Ry Kyu Islands (Okinawa) three years earlier. In 1922 Ginchin Funkoshi’s Okinawan Karte-Do was accepted by authorities at the Botoku Kai in Kyoto Japan after all linkage to China was removed and the Japanese style Gi & belt ranking was accpeted. This helped Korea Martial Practitioners with a system that was acceptable to the colonial government. From 1922 to 1945 Japanese “Karate” dominated Korea. Korean styles could not be openly practiced. It was also during this period that many Koreans migrated to China & Japan to work or study. At the end of World War II many of these people returned to Korea and along with instructors already in Korea taught their respective styles of martial arts. After 80 years of Japanese colonial rule much was lost of traditional Korean Arts. Original Korean Arts: Tae Kyon – Soo Bak – Kwon Bub. It is also likely that other arts may have been practiced in temples & in royal courts during ancient times. During the Korean War (1950 to 1953), many Korean instructors were killed in action. Following the war the government of South Korea began a movement to rebuild itself to its past greatness and to resurrect Korean culture. All traces of Japanese & Chinese influence would have to be removed. Government officials suggested government support to those that were unifying martial arts & a movement was afoot to unify the countries fragmented Kwans (schools). 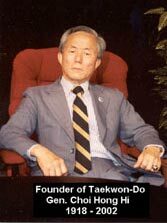 In 1955 most of the Kwans unified under the name of Tae Kwon Do with General Choi Hong Hi as President. During the 1960’s & 1970’s differences in the direction of Tae Kwon Do arose, and as a result the international Tae Kwon Do Federation (ITF) took on a traditional focus and the Word Tae Kwon Do Federation (WTF) refocused with a priority for Olympic competition. Since that time, other TKD organizations have also developed. In 1964 Mr. Stuart Allen, while in the service, studied Tae Kwon Do from Mr. Park Won Ha at Tong Du Chon, Korea. Upon returning to the United States at the end of his service time, Mr. Allen opened his first Dojang on Washington Street in Providence, Rhode Island. In 1973 Mr. Allen and Mr. Dan Zarbo opened their new school on Duke Street in East Greenwich, RI. This school remained open through the early 1980’s with a few different instructors taking over as older instructors moved or retired. In the early 1980’s East Coast Tae Kwon Do Association was founded by a couple black belt students and Mr. Allen and Mr. Zarbo. In 2010, Mr. Norman Wrigley opened his first TKD School in Altoona, IA naming it after the association from which he trained under, “East Coast Tae Kwon Do”.